Just after the half and full marathons split. 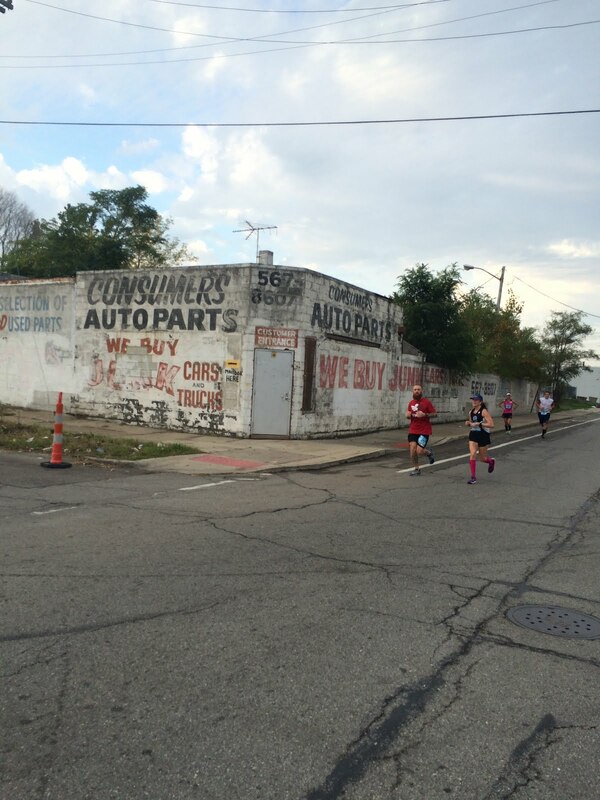 I've needed some time to reflect before writing about the Detroit Free Press Marathon. 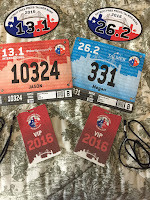 A lot happened that weekend, from volunteering as a race Ambassador to spectating the Saturday 5k to running my second 26.2. I needed time to reflect, analyze, discuss, and process different assessments of my run before trying to write about it. 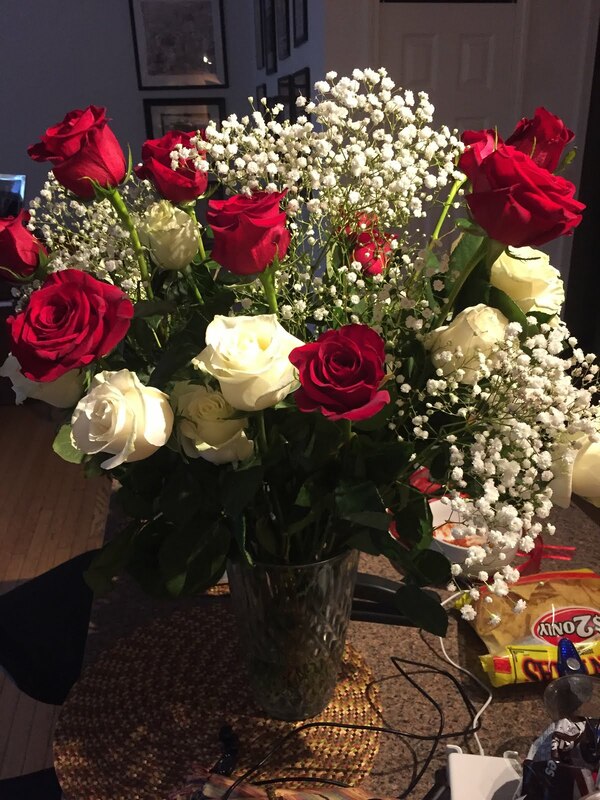 That's right, #Freepmas started on Tuesday with my awesome mom bringing me 26 roses at school. 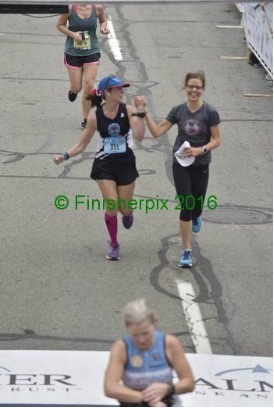 She missed my first marathon in Toledo because she had something else important she had to attend. Then she realized she was going to have to miss the Freep because of her high school drama group's first ever reunion, after 40 years, in New Orleans! She felt SO BAD. I'm so okay with it, though, because there WILL be a third marathon for her to spectate, and that's a pretty awesome statement to be able to make. Also busted out the "first marathon shoes" on Tuesday. Wore these for Glass City in April. I love this tradition. It was humbling and inspiring to be able to pull these out in preparation for the Freep. While holding them in my hands, I could literally feel the weight of over 1000 miles in training for both races. I could feel the exhaustion, but I could also feel the pride. 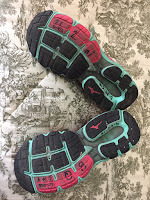 Nothing says "first marathon" more than feeling the worn spots where you toe off, or seeing the soles worn down to the point where you can't wear them anymore. 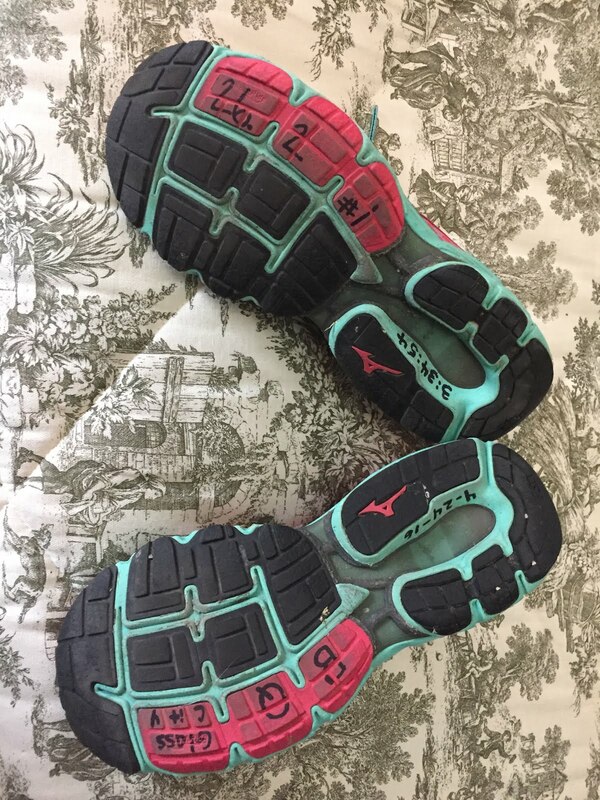 These shoes are a physical reminder of everything that being a marathoner is. 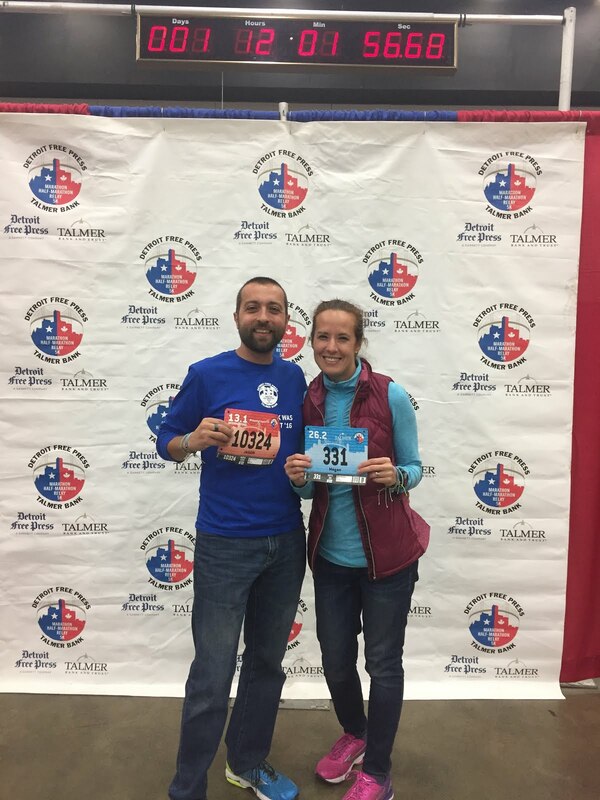 My husband, Jason, and I have run the Freep three times and we've fundraised for the Juvenile Diabetes Research Foundation (JDRF) every time. Jason's had T1D since he was 12 years old and raising money to fund research is a big deal for us. We're so grateful to our family and friends who supported us in our efforts. 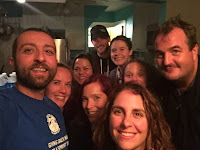 We ended up raising $835 and our team raised more than any previous metro Detroit Freep team! I was very honored to speak at the dinner. 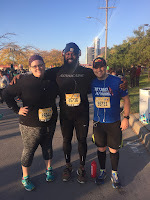 Most of the runners on the team run in honor of someone with diabetes and aren't diabetics themselves, aside from Jason and another runner, both of whom ran the 13.1. Since I was speaking to family and friends of diabetics, I spoke about Jason's and my journey through running with diabetes. I was so scared something would happen to him when we ran our first three half marathons. During the first one, I refused to leave his side until about mile 12. 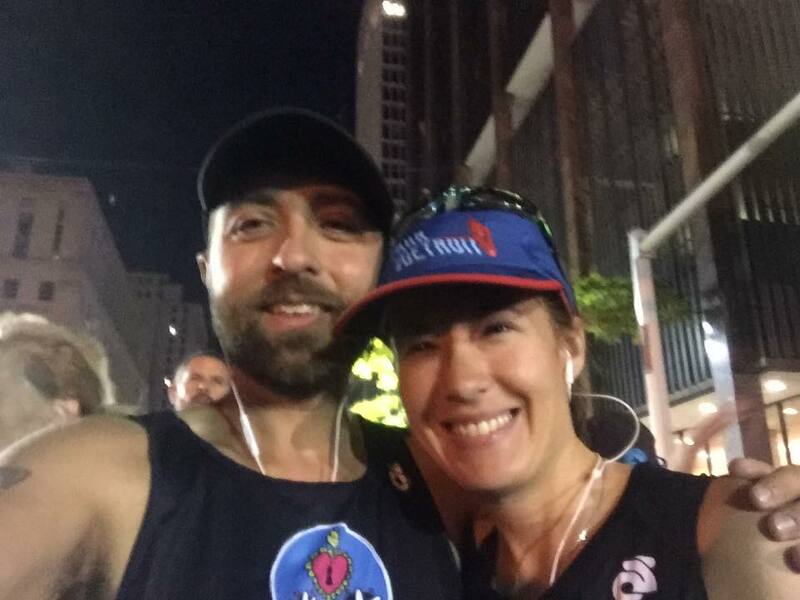 During the second race, I sped up around mile 10, but kept looking over my shoulder until we were reunited at the finish. During that third race, I finally ran my own race after the first couple of miles and let him run his. Sometimes his sugar dips during a race, but he's able to handle it, just like he does outside of running, and it seems like someone in our run family is always there for him. I also spoke about the standard to which we hold our diabetic family and friends. It's so important not to treat them like they're incapable of running a half marathon, or competing in triathlon, or whatever they want to do. Jason's parents didn't try to limit him; he wrestled through high school. I don't try to limit him; he runs half marathons. You have to be smart and careful, but they don't need to be told what they can't do. They hear that enough. I get so much more back from fundraising than the money I raise. The next day, I got a message from another JDRF runner. 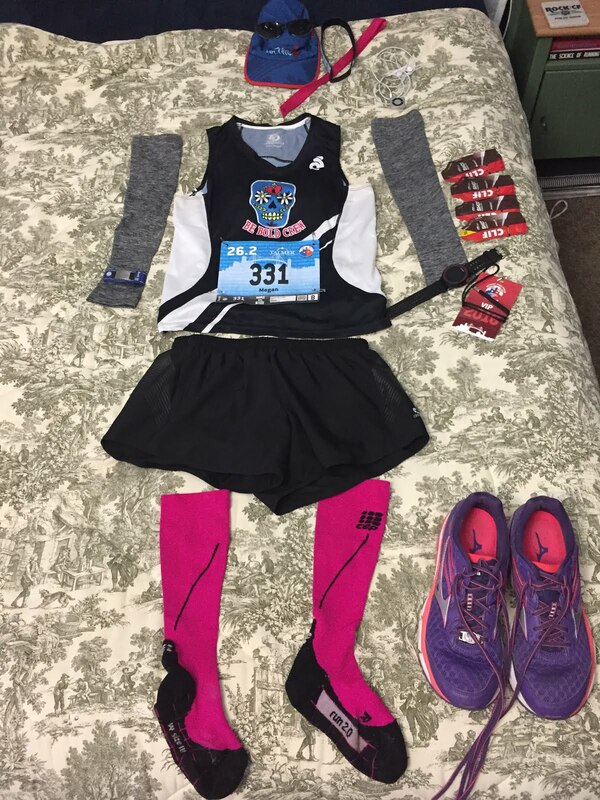 She was running her first full marathon in honor of her T1D husband. She let me know she was touched and inspired by our story. The simple act of talking to another spouse of a person with T1D who understands the struggle, and having the opportunity to encourage a first-time marathoner, was a gift to me. I get to coach two diabetic runners, Jason (my husband), and Kristyn. Kristyn and I ran for the same high school, but she's younger than me, so she was friends with my sister. Now I get to share not only my expertise as a coach, but all of the knowledge I've gained through coaching Jason for the last few years, with Kristyn. 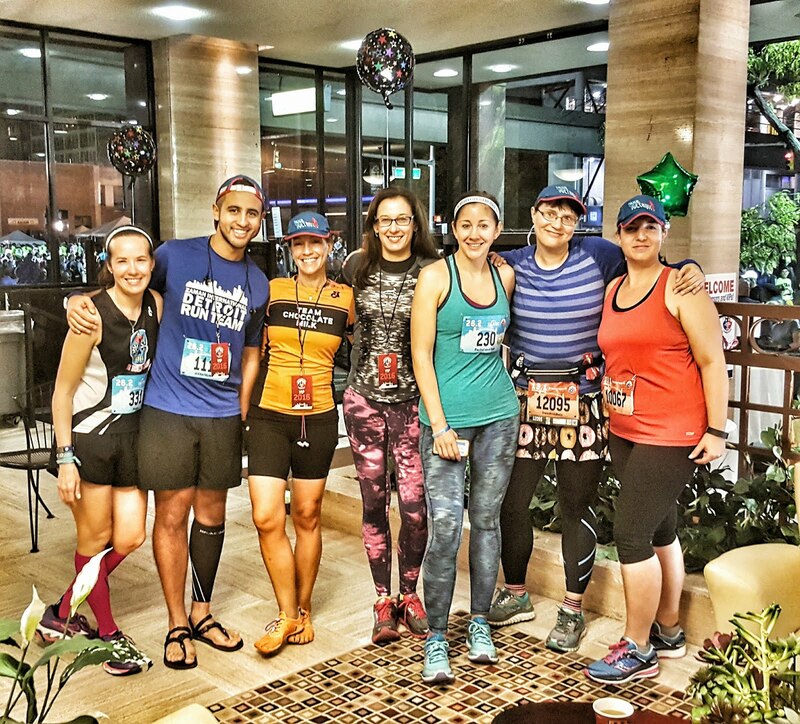 We all work together as a team to help navigate running with T1D. I'm honored, not just that they both trust me to coach them, but that they trust me to both push them to their limits and keep them safe. You don't realize or you forget how much it means to your loved one with T1D when you take on fundraising and running in their honor. Through training together and racing together and fundraising together, Jason and I take back some of the power and control that diabetes takes away. We have a deeper relationship because I do this for him and we do this together. I wish I could raise an amount of money that represented how much I gain through fundraising for JDRF. If you've never fundraised in conjunction with training for a race, I hope you'll consider. I wanted to celebrate the entire weekend of #Freepmas, so I took Friday off of work. Leah, who works for the race and started the Ambassador program, took me up on my offer to help her throughout the day, so I met her at the Freep offices at 7:00 am. We packed up her car and then loaded in at Cobo. 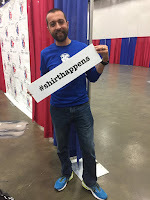 It was SO COOL to see the expo before other runners were there, and exciting to help with setup. 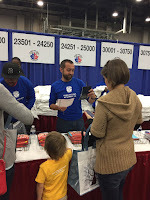 I distributed vendor packets, assigned Achilles and Kids Run bibs and shirts, organized volunteer shirts, and laid down Chevy stickers on the floor. Around 1:30, the other Ambassadors started showing up and we set up shop at the Ambassador/Information booth. Until about 5:00, we were super busy answering questions from runners, giving away Freep swag, and being the face of the race. It was truly an honor to represent the race with this group of people. 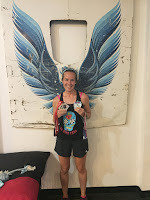 I don't know how she did it, but Leah managed to pick a group of 11 runners, all with different reasons, races, and paces, who were all just genuinely kind, caring, happy representatives of their running communities. And we had a blast! 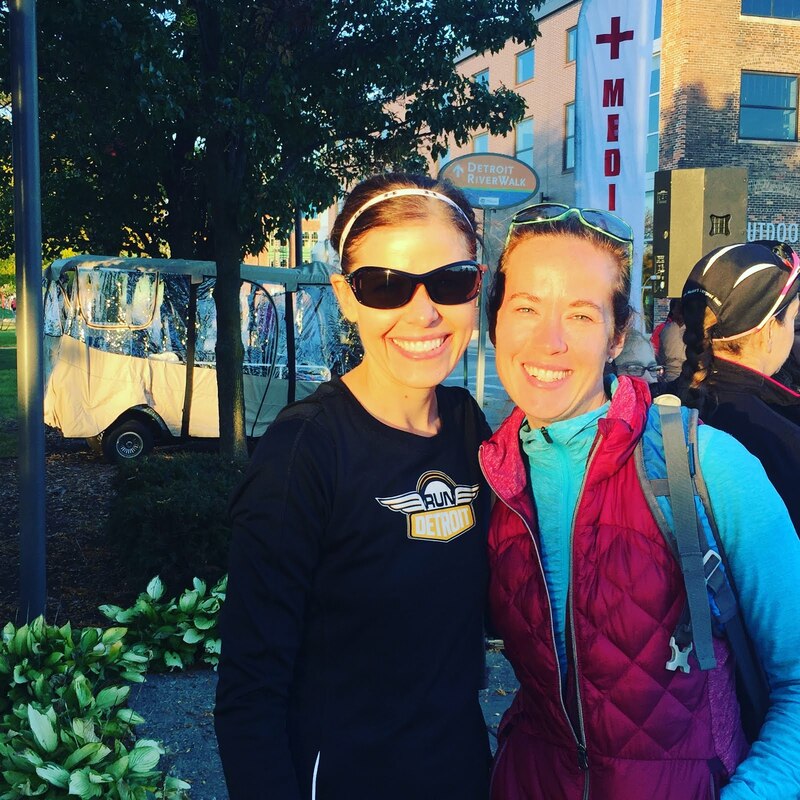 We were pretty proud of how much we knew and we loved sharing our knowledge and personal insight with runners. It was especially fun talking to people who were running the race for the first time or running their first full and half marathons. 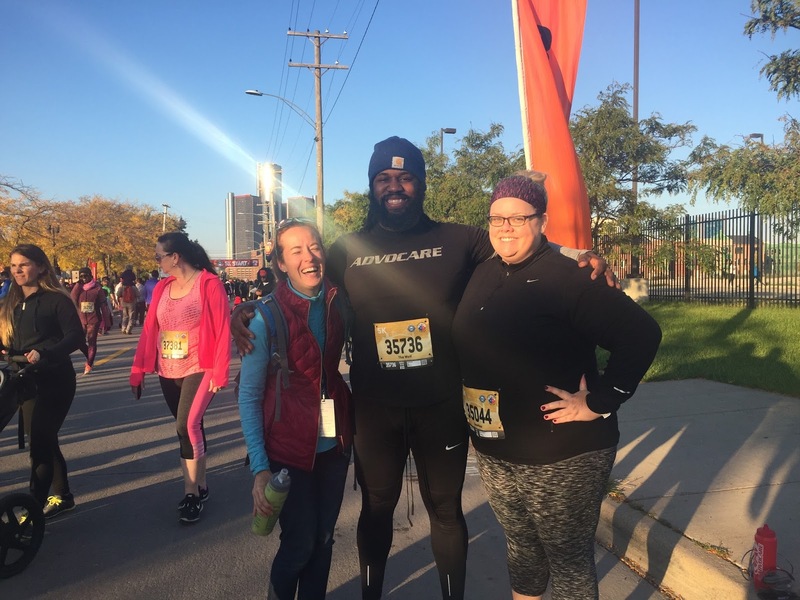 I was grateful for the opportunity to pass along words of encouragement and excitement like people did for me when I was running my first half and full. It made my heart so happy. What made this even better was that Jason, was right there with me, volunteering at packet pickup. 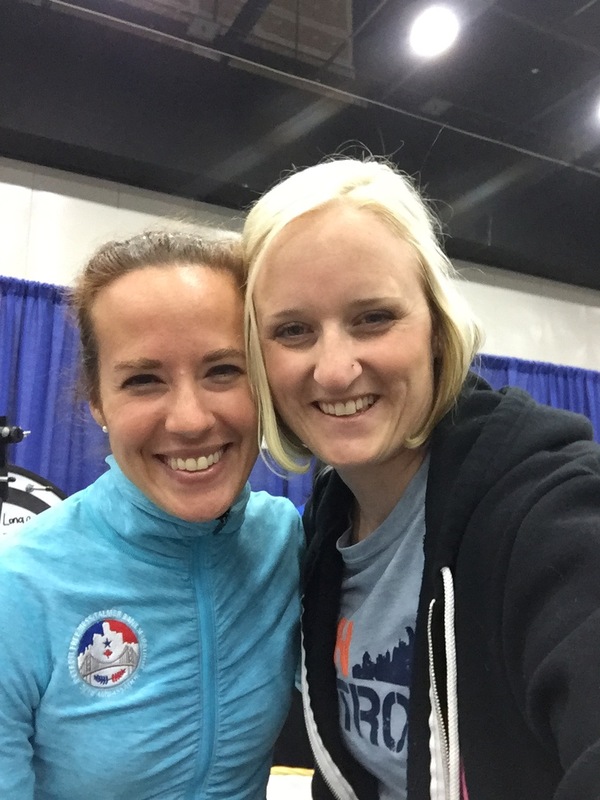 I finally got to see my runner, Kristyn, who I've been coaching towards her second Freep 13.1, and I got to hug other runner friends coming through the expo. It was so great to be right in the midst of the excitement. 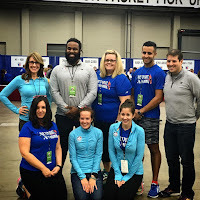 If you love running and love the Freep, you really should consider volunteering. 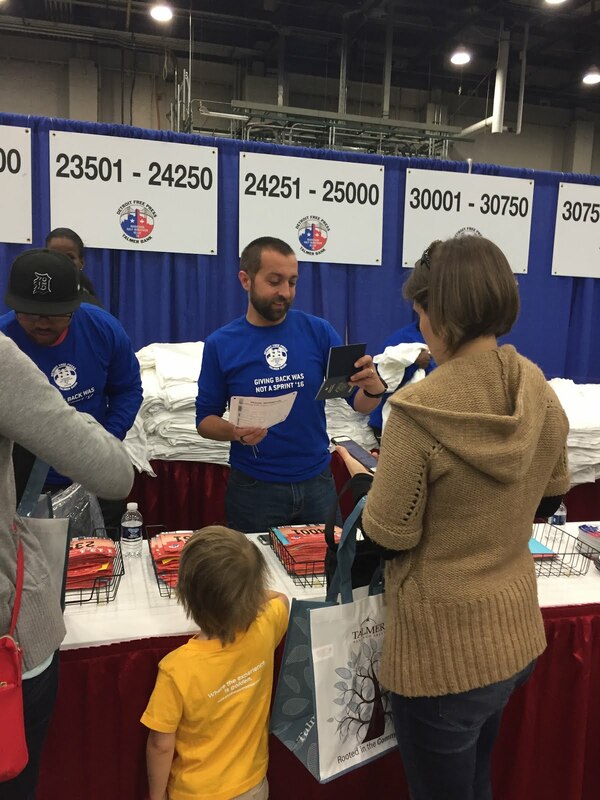 The race can't happen without volunteers, but you get back so much more than the time you give. You get to be a part of something BIG. You get to pass along the run-love to others. You get to start race weekend early! You learn more about what it takes to put on the race we love so much. And you get a cool volunteer shirt! This race has given me so much. It was my first half marathon. It was my springboard back into running. 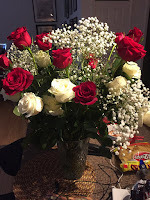 It gave my husband and I something to enjoy together. It's brought us health, new friends, challenges, setbacks, and successes. Volunteering is the least we can do to give back. I picked up my own packet while I was volunteering. 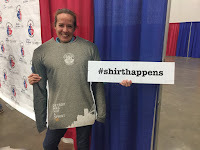 BLUE BIB (26.2)! When we were finished volunteering, Jason bought me a 26.2 finisher sweatshirt. I wasn't going to buy anything since we got such sweet Ambassador shirts, but I really wanted something to commemorate my first Freep 26.2. Then we got some pictures. I still have no clue what made me sign up for that first Freep 13.1, but I'm so glad that guy let me talk him into running it with me. It wouldn't be the same without him. Also, major credit to the Freep team for their handling #ShirtGate2016. 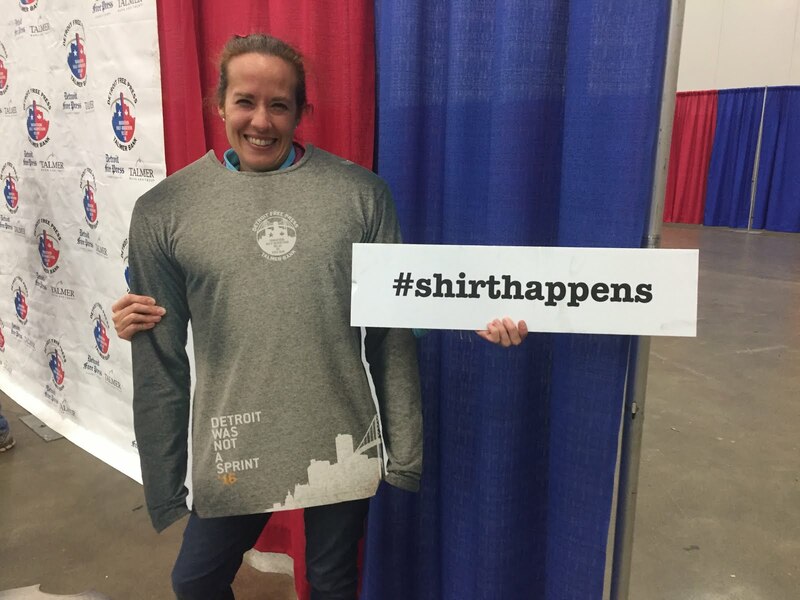 They got the information out there, gave runners an EXTRA shirt, and found the humor in a difficult situation. 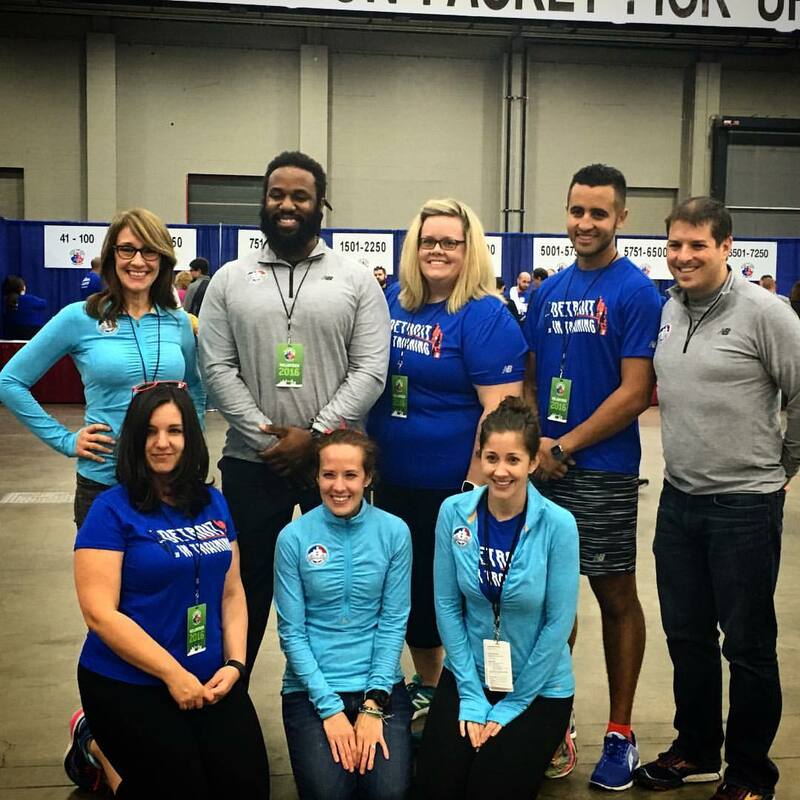 Between the 5k, both 13.1's, and the 26.2, our Crew had 19 runners run the Freep and we are SUPER PROUD of each and every one of them! Pasta party on Friday night was a great chance to relax, eat, laugh, and spend time together before the races began. Also, great chance to foam roll. Because you know that if you walk into another runner's house and immediately ask where their foam roller is and if you can use it, they'll have no problem with this and won't find it odd at all that you're foam rolling in their kitchen while chatting with them as they cook the pasta (thank you Geo). 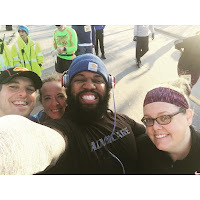 I went to the 5k to spectate my best friend, Amanda, and our Freep Ambassadors, Heather, Aaron, and Jeff. I knew spectating would get me excited for my own race; I just didn't realize how much it would do for me. First, I'm really impressed with race operations that morning. We got there around 8:00 for the 9:00 race and had no trouble parking in the free parking lot. The sun was shining, the air was cool, music was playing, and people were excited. 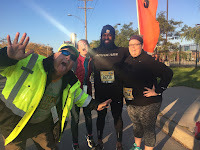 We quickly found our Be Bold Crew and RUNdetroit friends who were volunteering and I gave Amanda a hug and wished her luck. Then I spotted Aaron and we quickly met up with Heather and Jeff. Even though I've only known these people for less than a year, they feel like old friends. That's the magic of the running community. We laughed, took pictures, and then they were off to the starting line. The gun went off, and Jason and I ran down Atwater, away from the crowds. I wanted to cheer and lend support where spectators were thin. I know how lonely it can feel out there. I was so excited for each of my friends because I know their stories. I know their fight. Amanda's been battling injuries for months. She hardly got to run all summer. As teachers, we LOVE summer running because we can run when we want, where we want, for as long as we want. I was so sad that she missed summer running. Then she found out she could run, but not very far. By race day she was up to about 6 miles. She missed her fall marathon. She wants to train for Boston, but she doesn't know if she'll be able to run 26.2 without pain. But she ran a BOLD 5k a few weeks prior to this and shaved another two minutes off at this race! THAT made my heart happy. 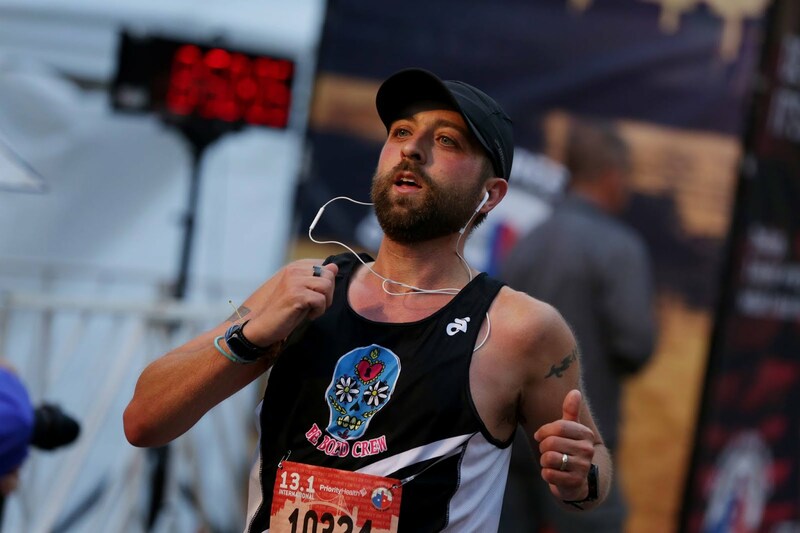 Jeff battled an achilles injury and crossed trained for the month leading up to this race. Aaron's been focused on strength training. Heather's been fighting an old injury and the emotional roller coaster of life we all get on from time to time. I got to cheer for Jeff and then Aaron as they ran past. 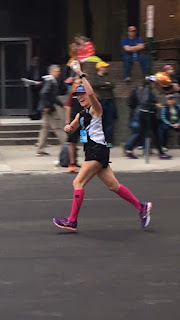 I got to cheer my heart out for each runner who passed me. Some nodded, some waved, some high-fived me, some kept their focus. I've been each of those runners out on the course, at different times. Being the spectator, who gave them that push they needed to finish and enjoy the struggle, made me feel so damn good. Then Jeff came back and cheered with us as we waited for Heather. When we saw her coming my heart was full. I wanted her to have a good race. I wanted her to enjoy the race we all love so much. I wanted her to be happy. And, from the smile on her face, she was. We joined her on the course and went almost to the finish line with her. And now my heart was ready for Sunday's race. But first, the shake out run. Running isn't inherently dangerous, but I am inherently a klutz. A BIG KLUTZ. I'm always afraid my dog's going to trip me while I'm going down the stairs the day before a race. Well, biggest fears imagined. Except that, instead of the dog tripping me, I tripped over my own feet. And instead of falling down the stairs, I fell on the concrete sidewalk at Woodward and Grand Boulevard. On my hip. Which is still, almost three weeks later, bruised with a huge bump. Laid on the sidewalk for about three minutes. Thank god Jason was with me. Walked back home and immediately iced, rested, used Aspercreme and Helychrisum (essential oil), took Aleve, and called my awesome massage therapist, Erin. She was out of town, but walked me through how to tape it with KT tape. My psoas is often tight, and I was worried this would aggravate it over 26.2. At least this gave me something to focus on in stead of just worrying about my race. I love looking back through my pictures and seeing Jason and my bibs from all the races we've run together. I also love sharing my Flat Megan picture in our Be Bold Crew Facebook group and seeing everyone else's race kit laid out. In the final, nervous, exciting hours before the race, we encourage each other, offer words of support and excitement, and remind each other of all the hard work and dedication that's brought us to this moment. ONE MORE SLEEP TO FREEP! I mean, it really is just like Christmas. You wake up before the 5:00 am alarm goes off and can't fall back asleep. Except no one tries to send you back to bed! For us, the only tough part of marathon morning is Jason's blood sugar. Last year, he woke up with 49 mg/dl. Good would be 70-100. 49 means chug juice, eat chocolate, eat shot bloks, don't run. He ate, ran, and PRed. This year, it was better, but still not great. If he's going to run a race, he'd rather be closer to 200. He was around 65. Better than 49! Juice, breakfast, Snickers, Shot Bloks. Get dressed. Bathroom. Geo shows up. I go to the door to let him in and realize I'm going to be hot in shorts and a tank top, and it's only 5:45 am. Bye bye, arm warmers. We all drive down together, park, and walk towards the race with 45 minutes until the start. Jason and I quickly drop bags at gear check and head to Freep VIP while Geo heads to RUNdetroit VIP. Ambassador perk <3 Nice to be able to use the bathrooms, and nice that it was right across from our corral (B). 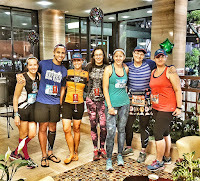 Awesome to connect with the other Ambassadors before our races. Out to the starting line to enjoy the final minutes before the start of the race. The energy is electric. 6:58, and the Marathon Disability Division takes off. Whoops and cheers and hollers. Those guys are amazing. 2 minutes until waves A and B start. Finals hugs and kisses. 3....2...1...GO! Commence marathon number 2. The plan: Run negative splits. Don't go out too fast. Have fun. Aiming for a 3:32:00 (2:54 faster than in April). I ROCKED those goals in the first half! I kept my pace in check. I saw Kristyn a few times! I saw Terra! I crushed the Ambassador Bridge and the tunnel. I'm so grateful we run most of our long runs up north where we regularly run hills. I smiled, laughed, chatted with other runners, thanked volunteers, high-fived spectators, and enjoyed the first half. I saw Terra's Granny and Dad, Romeo, and other friends. I felt great. I got really worried when I saw Romeo around mile 9 and he told me Jason was right in front of me. Jason ran the half and should have been way ahead of me. His sugar had tanked. I walked with him for a few seconds and made sure he was going to be okay. 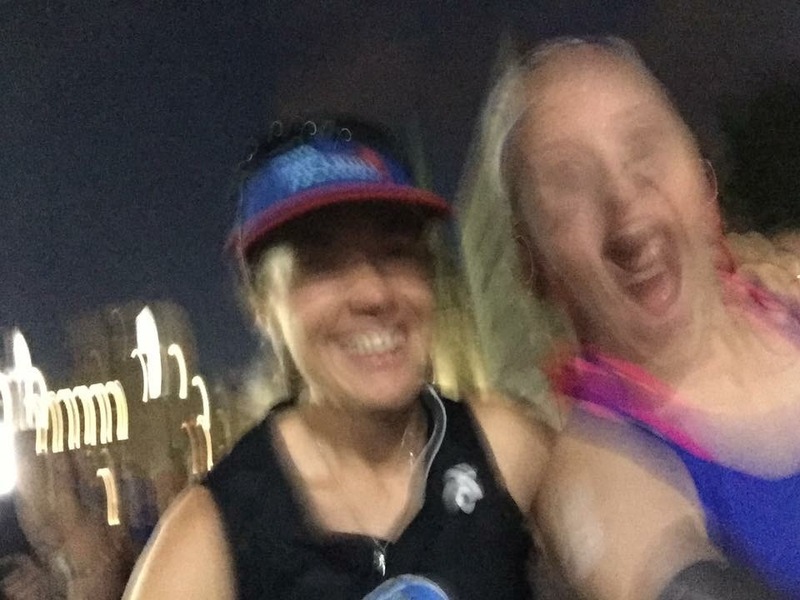 We've come so far since our first half marathons. I trusted him when he said he'd be okay, and I kept running. He later told me he finished his Shot Bloks, threw back 4 cups of Gatorade, slowed down, and just enjoyed the race. He stopped at the med tent at the end, just to be safe. His sugar was definitely low. The humidity makes him burn through sugar way faster. I'm so damn proud of him, though. He accepted the situation that was the weather and his low sugar, and slowed down and had fun. I run in Detroit all the time, so I knew Lafayette might get lonely. I got lucky and ended up behind a runner in a Team RWB shirt, Daniel. I love what Team RWB does. 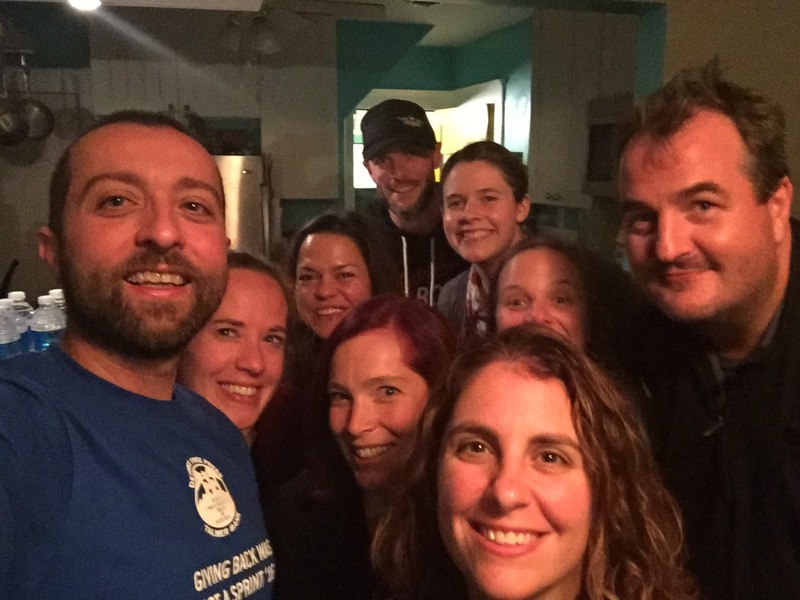 They bring together veterans and civilians and foster relationships and healing through running. Romeo is the Athletic Director for the Detroit chapter, is a Marine veteran, and runs with them, and I know they're good people. I started talking with the guy, found out he knew Romeo, and ended up running a couple of miles with him. I love this part of my 2016 Freep story. We were running towards West Village, where Be Bold Crew has lived since May. I was running with some guy I'd just met, yet we had a mutual friend. We were suffering together. We were toughing it out together and encouraging each other. I finally ran ahead, but I ended up catching up with him and sharing a hug at the finish line. Later that night, Romeo told me he asked him to thank me for sticking with him. I hope I see him again. Around mile 18, I hit the wall and I hit it hard. Same as in Glass City. All that easy running in the first half made no difference. I felt fine aerobically, but my legs had no energy. Dead and heavy. Just not enough carbs left. Didn't fuel right before and during, even though I thought I was doing it right. Two weeks later and I'm working on that with my nutritionist, Bri. Still figuring out my iron as well. But this time, I was stronger mentally. I didn't let it get me down. I kept a smile on my face. I slowed down and didn't let myself feel disappointed or defeated. I stopped for a freaking beer on the Riverwalk. Or at least I thought it was the Riverwalk. I have no sense of direction and I was tired and I later found out the beer was NOT on the Riverwalk, it was on Atwater. And then Amanda appeared. God bless her. She ran with Brian, then she ran with Geo, and then she came and ran the last mile and a half with me. I have no idea what I said to her. I just know she talked to me and kept my mind off how slow I felt and helped me truly enjoy the final miles. She reminded me of what a true friend and coach is. Love this girl. In the end, I finished almost 13 minutes slower than Glass City in April. I felt slow all summer. I knew the weather wasn't in my favor. But I still had hope. I was disappointed with my race. But I knew I had a lot of qualitative success. I was mentally stronger. I didn't go out too fast. I felt awesome on the hills. And I enjoyed the heck out of the race. My legs weren't destroyed at the end and I recovered a lot faster. I spent a weekend with Jason and friends I love like family. I raised money for JDRF. My runners ran their hearts out. I achieved my 2016 goal of 26.2x2in2016withBQ. Still, I needed time to process, because these small victories weren't enough. And, through a lot of thought and writing and talking to people who know me, I've come up with a few takeaways. First, I'm a competitive person. I never thought of myself that way before. But, deep down, I want to win. I mean, I know I won't ever win my division in a race this big, but I at least wanted to come close to top 10 in my division (I was 17th in my division and 81st female OA), and I really, really, really wanted to get my 2018 BQ. I know not everyone has the same goals as me, and that's what makes running great. But I was disappointed in THIS aspect of the race. But this brings me to another observation. I've never looked at having a competitive nature as being a good thing. I'm a teacher. I want my students (my kids) to be happy. And, if someone wins, that means other people lose. And those people aren't happy. But you know, that's life. And it's okay if you don't win. And you don't have to be happy all the time. For me, it lights that fire to be even better the next time. And oh, next time is coming. As long as I'm doing everything I can do to be the best I can be, I'm satisfied. And that's where my joy happens. My joy is in the planning. My joy is in the training. All those hundreds and hundreds of miles getting ready for the next race. Running in snow and ice, after long days at work when I'd rather be sleeping. Working with my coach and my nutritionist. Training log entries as long as a book. Mechanics class. The Human Performance Clinic. Knowing that I'm giving my all to something I have a passion for. Grateful I have something I'm this passionate about that I can do for the rest of my life. 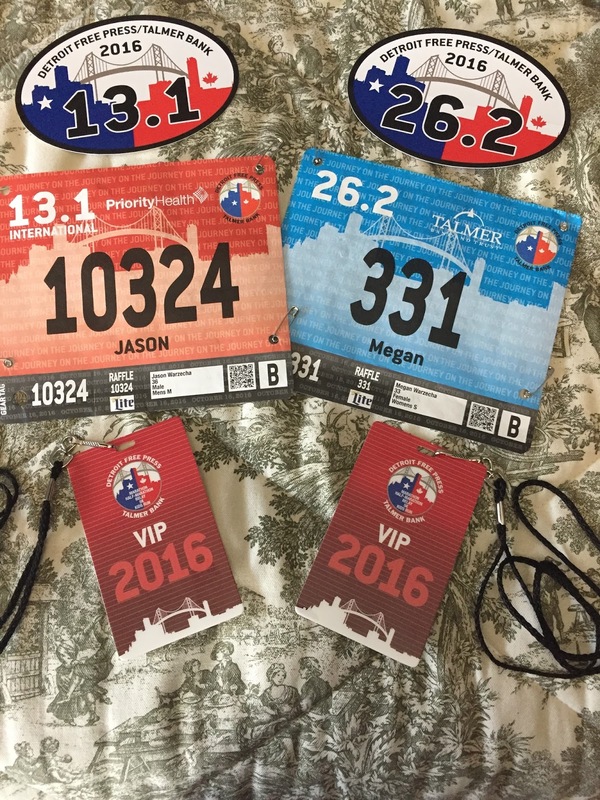 Grateful I can share it with my number one guy, my running-buddy-hubby, Jason. And I'm GLAD I was disappointed by my performance. I'm glad I don't accept it. I'm glad I can enjoy some elements, and walk away ready to go to battle for the next one. Because, "When you stop fighting, you stop living. So find your fight. Then fight like hell 'till your battle has won." Thank you, running, for all you give me.